LASER (Light Amplification by Stimulated Emission of Radiation), or Red Light Phototherapy or Photobiomodulation, is a form of electrotherapy that uses red light at wavelengths 980/810nm to transfer light energy which is absorbed by cells in the body. The absorbed light gives the cells more energy to perform their normal function at an improved rate, therefore resulting in improved bone and soft tissue healing (tendon, ligaments, muscles, skin), and reducing the formation of scar tissue, as well as providing pain relief. We use Companion Care CT-X LASER treatment with many of our cases. Research has demonstrated that for best results it is advisable for the first 5 LASER sessions to be over 2 weeks in order to build up an accumulative effect and kick start improved rates of healing and pain relief. Some animals require more/less than 5 sessions to start noticing a difference. 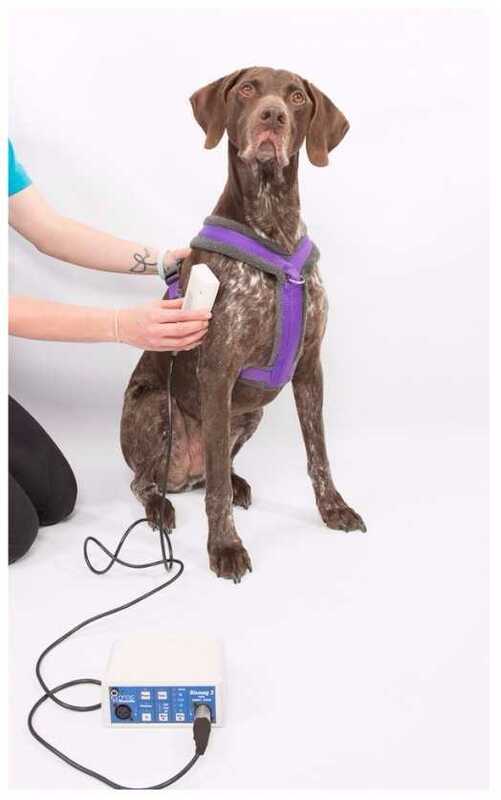 Once your animal starts seeing the benefits of LASER treatment, the frequency of sessions can be adjusted accordingly to find a 'maintenance' level of treatment that complements physiotherapy treatment.